Journal : West Riding Lunatic Asylum Medical Reports ; vol. iv. London : Smith, Elder, & Co., 1874. Description : 265-290 p. [1 l. pl.] ; ill.: 1 phot. ; 21.5 cm. Photograph : one leaf with mounted woodburytype of the clinical subject. Subject : Brain — Function ; primary dementia. 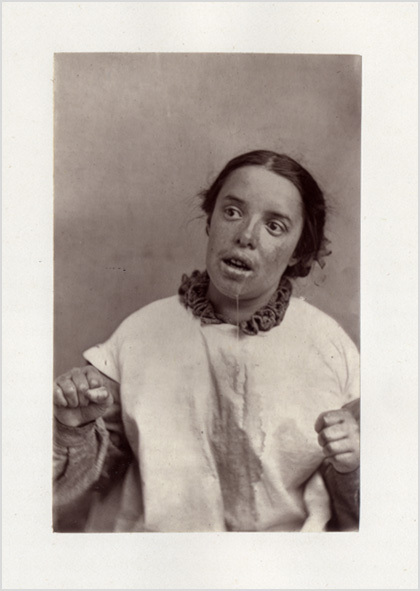 Author caption: By J. Crichton Browne, M.D., F.R.S.E., Medical Director, West Riding Asylum ; and lecturer on mental diseases to the Leeds School of Medicine. One of these examples, has been photographed as an illustration for this Paper by Mr. George Bracey, and fairly typifies its physiognomy. The vacant expression, open mouth, dribbling saliva, and fixed attitude, which is preserved by this patient constatnly, are very characteristic. Perhaps the fault of the photograph is that the expression is not quite vacant enough for a case of acute dementia, in which there is generally some drooping of the eyelids, with a half-sleepy voidness and blurred stolidity of countenance. — Page 276.